Dr. Barbara E. Reider received her PhD from Bryn Mawr in Human Development. She has spent her career as a teacher of teachers and school administrators. Upon moving to Santa Fe, Dr. Reider served as Chair of the Education Department at the College of Santa Fe and then as a Visiting Professor for New Mexico Highlands University. 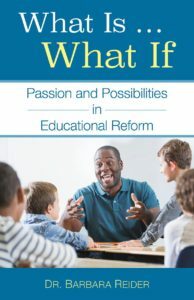 Her main educational focus has been to create space for teachers and administrators to explore methods of teaching and learning that support all students and which emphasizes the teacher’s own professional voice.